A pedestrian is in critical condition after being hit by a vehicle near Flamingo and Pecos roads around 4:30 a.m. Saturday. This is a roundup of all the breaking news from around the Las Vegas valley for July 7, 2018. The Clark County Fire Department says there is a wildfire in the Trout Canyon area. They're assisting the U.S. Forrest Service in fighting the fire, along with crews from the Bureau of Land Management. READ MORE . Pecos Road is closed between Stewart Avenue and Sunrise Avenue due to a fatal crash. Drivers are advised to use other routes. READ MORE . Firefighters responded to reports of a fire at the Orleans hotel-casino around 11:22 a.m. When they arrived, they learned that a sprinkler accidentally went off, and there was no fire. The Orleans is handling water and salvage issues. Clark County firefighters were called to the scene of a mobile home fire around 10:20 a.m. They were able to put it out within eight minutes. No injuries were reported and the cause is under investigation. 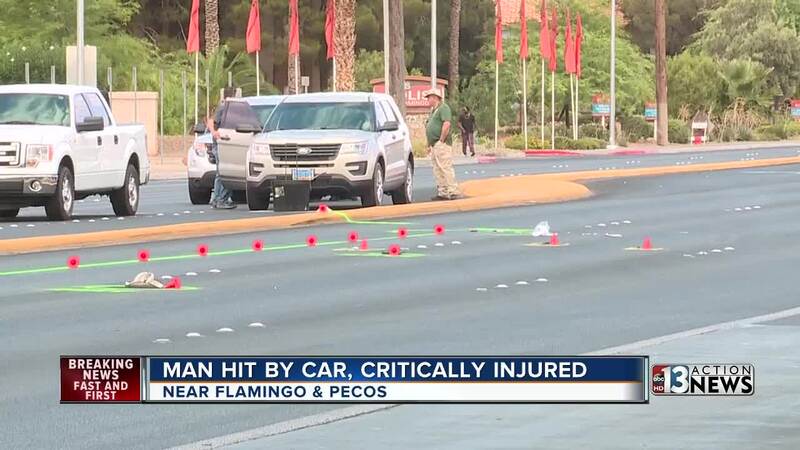 A pedestrian is in critical condition after being hit by a vehicle near Flamingo and Pecos roads around 4:30 a.m. Las Vegas police say the pedestrian appears to have been outside of a marked crosswalk when hit. This is an ongoing investigation.